This is the week I left home with my manuscript to hide myself away and plunge into editing and revising. I had the generous loan of a cottage in Long Beach (Washington), so I loaded up a few clothes, a lot of paper and pencils, my MS in a box, some food items and my Macbook, and headed for Southwest Washington. Here’s how that trip starts — out Highway 101 and Route 8, past the Black Hills towns of McCleary and Elma, then down to Satsop and Brady. Turn left at Monte (Montesano) onto Route 107 — not toward Cozzie (Cosmopolis) and Aberdeen. Join 101 again and turn south for North River and Artic. No, not Arctic, Artic. I have driven this way many times before but I think never just at this moment, in the heart of springtime. The route traverses only three counties — Thurston, Grays Harbor, and Pacific — but as I always said back in those far off days when I lived and worked in and around Westport, Grayland and Tokeland, this part of Washington isn’t really part of the United States at all. It is Other. This is especially true at some nebulous point south of Raymond and South Bend, maybe around Bay Center or the three-forked Nemah River. Even before you hit South Bend, there are piles of oyster shell and no immediate signs of prosperity. The landscape bears the scars of rapacious clear cutting. The fishing hamlets, the rivers and sloughs, the glimpses of Willapa Bay, the few cars, and the terrifying logging trucks are telling you something: Pay attention. This is different. 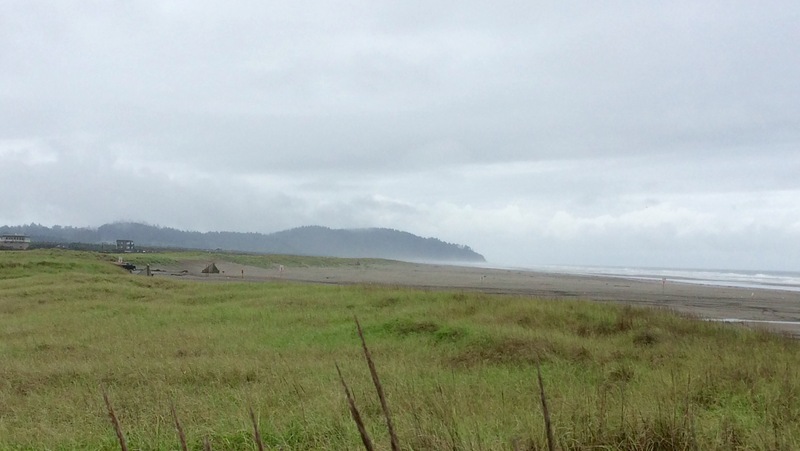 By the time I turn west for Long Beach Peninsula and begin to skirt the southern edge of the bay I am in the Willapa Wildlife Refuge, where my jaw drops and I begin talking to myself and threading descriptive phrases together in my head. This is a world of fir-covered hills, lingering mists, solitude, distance. Everything is green or gray. Forest and water. Hill and meandering slough. Out on the bay, broad expanses of silvery water, low hills in the distance, mysterious castle-like wooded islets just offshore. What you are seeing tugs at your heart. This is Lewis and Clark country. The Corps of Discovery saw this! Sacajawea saw this! There is not a straight line in sight. The road curves, the leaves and branches curl and turn up. The streams and rivers and sloughs meander and play out. There are more shades of green than can possibly be named. Hemlock and Doug fir, the occasional cedar, are standing sentinel upon the hills. Pearl gray clouds hang above slate gray water. The world is water — the bay, the placid streams smooth as a plate winding through mounds of sumptuous emerald green rushes. There are mists that hover in place and mists that float away, palest gray. The local government appears to be made up of herons, gulls, ducks, geese, and crows; deer, elk, and fox are probably just out of sight. Who knows? Who named all the wetlands or backwaters, known here as sloughs (pronounced “slews”)? They are called Preachers, Greenhead, Teal, or family names like Johnson. Were all those rotting pilings once used for log rafts? It’s all part of the mystery. I have many rivers to cross on this journey. The North, the Palix, the Nemah, Naselle, Bone, Bear, Wallicut. I know stories about some of these places from when I lived here years ago — storms that bent tree trunks above the Palix to a frightening angle and, from my personal testimony, the possible sighting of a UFO in the Nemah River estuary. In 1893, a group of brazen businessmen stole the county records from Oysterville so they could establish the county seat at South Bend, a location more to their liking. Upon turning onto the peninsula, I encounter at last another color, the pink of cranberry bogs, along with the barest hint of civilization. No Starbucks, though. No supermarkets. No traffic jams. I have come through the watery world and now I am at the beach. My racing heart slows down. There is peace and quiet. Time and space to breathe, and to work. The beach beckons from time to time, but iffy weather and dedication keep my head down for the next couple of days. A good start. Thursday, on my way back home, I drive out to Bay Center and back, looking for a spot called Rhodesia Beach. It’s on the bay, but used to be a good spot for beach combing. The old Blue Heron Inn is now called Dock of the Bay. More tiny oyster companies and giant piles of shell. Wikipedia says the population of Bay Center (a “census-designated place”) is 174. People do physical work in this part of the world. They raise oysters or gillnet or run crab pots. Work in the woods (meaning, they are loggers.) Build things. Maybe they have to do too many things to make ends meet. Their spirit is unbeatable, but they are often insular. You see the same family names over and over on mailboxes, businesses, and campaign signs. The tide is high, so I give Rhodesia Beach a miss this time. I have no photos of Willapa Bay or the wildlife refuge to share with you. I was mesmerized and took a hundred shots in my head but couldn’t bring myself to stop. Oh, I want to go back! Categories: Inspiration, Pacific Northwest, Travels, Writing | Tags: Long Beach Peninsula, Long Beach Washington, Willapa Bay, Willapa National Wildlife Reguge | Permalink. Nice trip report. I hope you ate some oysters. You nailed that stretch of road where road, mist, and trees all dissolve in the water. Beautiful!! Thank you both for reading and thanks, Claire, for the lovely compliment! What a great description! My husband and I, too, have driven that road many times. We’ve joked that all roads lead to Raymond because, well, for some reason they seem too. 🙂 Thanks for the re-visit! Thank you, LaNae! You made my day. I was with you from the very first sentence–from the gathering of supplies and through all the driving. I hope you write more about your time there. Gorgeous writing, my dear. The southwest Washington environment of grey and green is spot on as is those crazy, heart-stopping logging trucks. I’m loving your blog posts. I’m with Claire–you perfectly captured that whole area. SO GLAD you had a great time, relaxing AND productive. You MUST write about or at least tell me next time I see you all about the UFO sighting and I’ll tell you about the UFO conference Jason and I attended near Mt. Adams. Teresa, thank you so much for these wonderful comments. They say you should write for an audience of one. I think for this piece, you are my ideal audience! I have just returned from your narrative, intrigued, yearning to be there still.